We had so many great looking Western and Australian hats to show, that we divided the pages! This is now Page 3. Did you Google and find us? 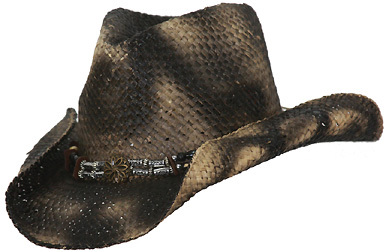 Click to Page 1 of Aussie Hats link ... you may need to see all that is offered. The Crushable Tassy's are so popular because they just go on and do a good job from the start. You can manipulate that wire a bit, after it is on your head, for just the right touch. The advantage is that they just pop into shape when you put them on your head. Although they are categorized as "crushable", and they can be folded or "wadded", you don't want to leave them all crushed for log periods of time. Just push 'em back to normal as you take them back to the closet. The Oilskins are just about as impervious to water as a hat can get. Expect them to be comfortable; but, they will loose some of that stiff look with wear. In fact, the more aged they become, the better you will love your Oilskin. Reproof them as needed with Duckback dressing. 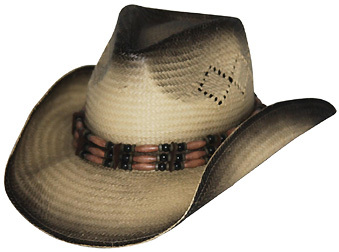 Outback straw hats will leave you cool headed, while turning heads. There’s nothing like a straw hat to refresh. They even smell of the great outdoors. 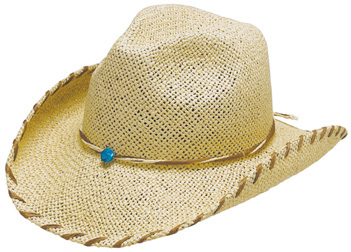 From the Beach to the Rodeo, there is a straw hat to cover your needs. A Straw hat is a fashion accessory to some, to others it completes their look. 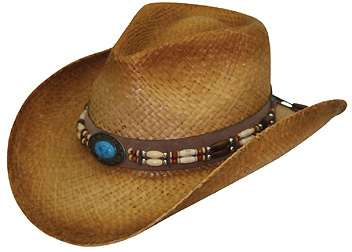 Outback Trading Company Straw Hats offer protection from the sun, a dry-zone sweatband, and a shapeable brim. Fun colors and hat bands. You just might need a Straw Hat for every occasion. 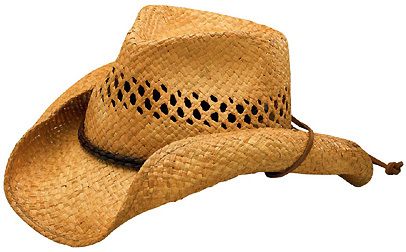 How do you help weather proof your Aussie Straw hat? 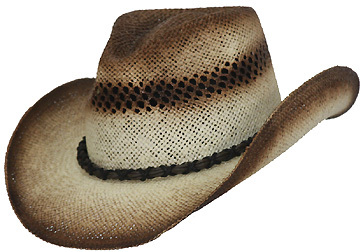 These natural fiber straw hats can be assisted by using several coats of Scout Brand Rain & Stain Protector. Spray, let dry about 10 minutes. Spray again. Let dry about 10 minutes. Repeat a couple more times and make your headwear more weather resistant in snow and easier to clean in mud. Remember the key is several lighter coats. Retreat after washing. If you don't mind some "yellowing", you can get clear lacquer from your building supply store and paint a coating on your hat as it ages, and softens. Shantung Straw with Tea colored highlights. Vented Crown. Pinched front. Simple lines that look great on anyone, male or female. UPF Protection. This is a worldwide most popular Raffia straw hat style. Made famous by Shady Brady Hats, this version is a little softer with less lacquers. Vented. Overall Tea stained color. UPF protection. Chin strap can be worn over the rear brim when not under your chin. Favored styling, straight from the Outback. 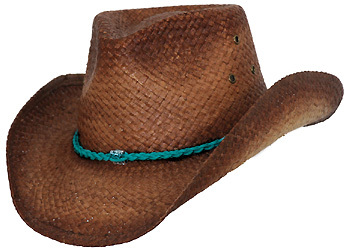 Plaited turquoise hatband. Eyelet vents. Pinched front raffia straw. 4 1/2" crown, 3 1/2" brim. UPF protection. CC Price is Only $24.99! Diamond vented Shantung straw. Bone & beaded hatband. UPF protection. • 4 1/2" crown, 3 1/2" brim. Vented Raffia straw with beaded "beach" band. Open weaving on brim to match. UPF protection. 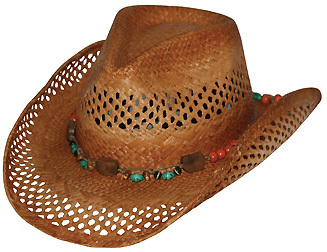 Rolled Raffia straw with laced brim edge and twisted hatband. Turquoise centerpiece. Raffia straw with Native beads. Turquoise centerpiece. UPF protection. 3 1/2 inch Crown. 3 1/2 inch Brim.